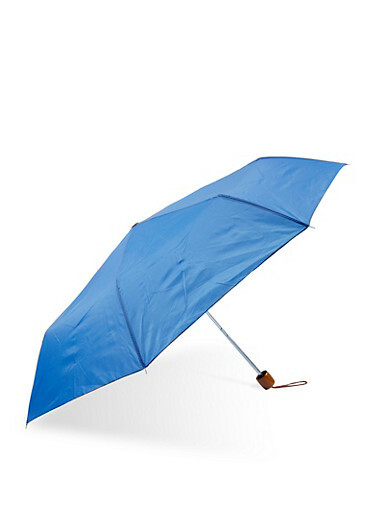 Umbrella Length - 10 in. When the umbrella opens how wide is it?What material it is made of? BEST ANSWER: I’d say this umbrella is wide enough for just one person and mostly suitable for the sun and light rainfall. It seems to be made of nylon-like material. All in all, it is the perfect size to fit in my handbag and the color is most stylish! When opened, it’s 38 inches wide. It’s made out of 100% polyester. It’s just like a regular umbrella, but since it folds up into about a 6 inch long contraption, it’s called compact.